The late afternoon sun warms my face as the cool ocean breeze keeps me bundled under the hood of my sweatshirt and in the bright colored blanket wrapped around me. I know it's time to move on, but I'm nowhere near ready. From my lounge chair, I can see the waves crashing against the sea wall and I'm entranced by the turquoise color of the water against the deep green trees that hang off the ocean-side cliffs. I imagined that seeing the world would mean chicken buses, squat toilets and long days trudging from one museum to the next. I should have known better. Those things aren't me (although I've had my share of squat toilets so far). My happiness with adventure comes from fresh air, mountains and the ocean. It comes from roaming through markets picking up the freshest seasonal food and bringing it back "home" to make our next meal. It particularly comes from spending time outside. And I'm in my happy place right now. Happy place - yurt in the far background. 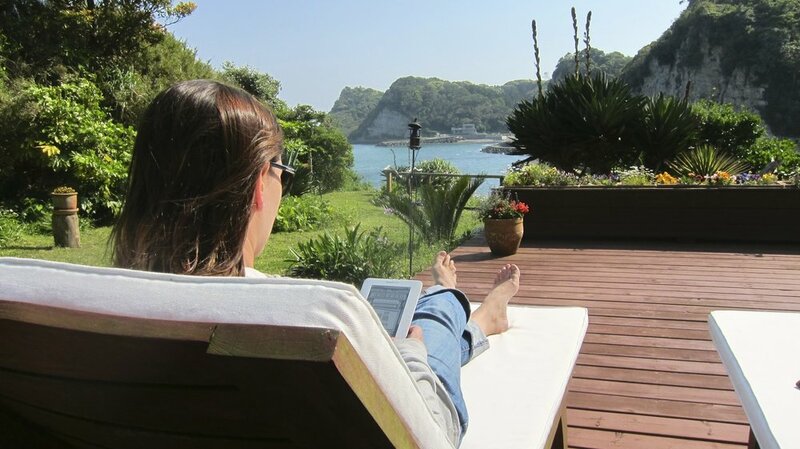 We've been staying in the town of Ohara in the Chiba prefecture of Japan for the last three days at the Reef Break Resort. Our train ride was just over an hour from Tokyo, but we seem a world away from the city of nearly 9 million people. For the past few days we've only had to worry about ourselves and two chickens who share our bit of land. 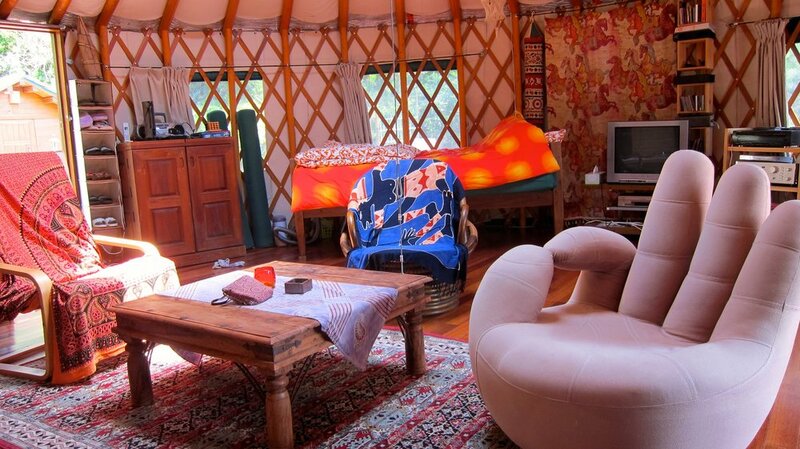 Our retreat is a yurt, a round, tent-like structure that includes a kitchen, a bed and my new favorite OK chair. We have a huge deck with an outside open-fire BBQ, a rotemburo (hot bath) and a bonfire pit. Not to mention a priceless view of the ocean and the sound of waves crashing to put us to sleep at night. The inside of the yurt and my favorite chair. Each day, the owner of the yurt brings us fresh eggs and checks on us. We are content to just hang around the yurt or go for short strolls to town. The houses in this ocean valley are traditional Japanese homes and older men and women are out tending to their gardens most days as we walk by. The market has the sweetest strawberries and oranges and we quickly become addicted to the cheap boxes of sushi for lunch. Whole Foods has nothing on this market. An evening with no wind provides the perfect opportunity for an ocean side bonfire of magnificent proportions. The sun setting over the hills is the most serene backdrop. Bonfire, almost on the beach. Sun setting over the hills. We will move on. On to the next town, the next adventure and luckily it is in the Japanese Alps. I'm encouraged by the idea that we will have more amazing views and will only have to exchange the ocean breeze for a mountain breeze. It feels like cheating on around the world travel and the chicken buses. But, I don't care. I'm doing what I want. For anyone who can't make it to this yurt in Japan, there is one in Northern California that is also a fantastic yurt retreat.